To start with, let's go grab some great GPS tracking data to play with. 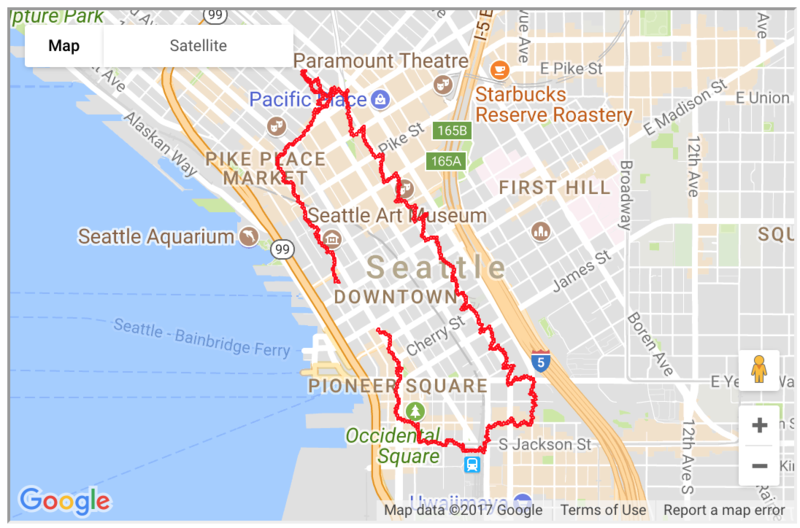 A company called MapMyRun keeps a wonderful database of walking/biking routes in various US cities, based on GPS tracks that users have submitted to the site. From a menu page one can pick from a variety of routes; for example let's pick one walking around the downtown Seattle business district. Note you must create a (free) account on that website to download the track data (the download button at bottom of each page is for climb/altitude data only; the track data comes via the "export this route" link on right of page). After setting up account you can download a GPX file with the track data. GPX files can contain multiple tracks, each with multiple segments, each with multiple tracking points. For this file the above shows only one track, with a single segment, containing 500 data points. The data files can contain time, altitude, and speed information too, and the above summary suggests those values are missing; we'll double-check that below. # some of this cell's code came from this link - thank you! So we've confirmed the lack of Altitude, Time, and Speed data; just Lon/Lat points. But at least the title string for the track lists total distance and date - the former we can verify with the data; the latter we cannot. gmap.draw("gmap.html")  # saves to html file for display below - hm, see note below about this. The Google Maps plot below is just the screenshot I took to show how it displayed in my Safari browser outside of Jupyter, actually even using the same <iframe width="45%" height="350" src="gmap.html"></iframe> as above in a separate HTML file (flanked by <HTML><BODY> and </BODY></HTML>), no problem in that case. It appears there's some check they're doing that prevents straightforward anonymous Google Maps calls from within Jupyter, oh well. df['dist(meters)'] = df.apply(lambda x: vincenty((x['Latitude'], x['Longitude']), (x['lastLat'], x['lastLong'])), axis = 1) * 1000. # The df['dist'][1:] above is because the "shift" sets the first lastLon,lastLat as NaN. That 0.18 mile difference above is about 274 meters. There may have there been a different instrument or method used by whoever entered that 3.52 into the title string, and also we did not take the elevation changes into account in the distance calculation (the elevation changes were available in that separate download link on the MapMyRun page and I didn't incorporate them into the dataframe here).